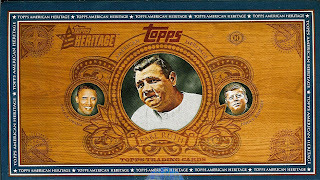 Topps brings a unique twist to the non-sport trading card genre with its debut of American Heritage. The product is reminiscent of one released a few years ago by Upper Deck and appropriately titled, US History. However, by capitalizing on their own history in the Hobby, Topps decided to utilize classic card designs of yesteryear in lieu of creating a whole new design. I had mixed reactions to this tactic at first feeling that a new brand calls for a new design but after seeing how they collated the design to match components of the base set, the idea and the cards themselves are growing on me.